It began with my usual Maiden & Foster weekly viewing. This usually happens on a Monday, part of the new week although Douglas has said he prefers Thursday. (The auction occurs on a Wednesday.) Thursday is the official day for M&F to receive goods. Douglas says he sometimes catches glimpses of treasures going in to be auctioned. (Some of these might have to await an antique auction.) It’s like a prior viewing. There is a kind of pleasurable ritual involved in a viewing. You maunder along rows of discarded, abandoned objects, your eye ranging over them in the hope that something ‘catches your eye’. But the fact is I always begin my peregrinations in exactly the same order and direction. Rather like a dog turning round and round before sleep, I am completely put off by starting a viewing in anti-clockwise fashion. 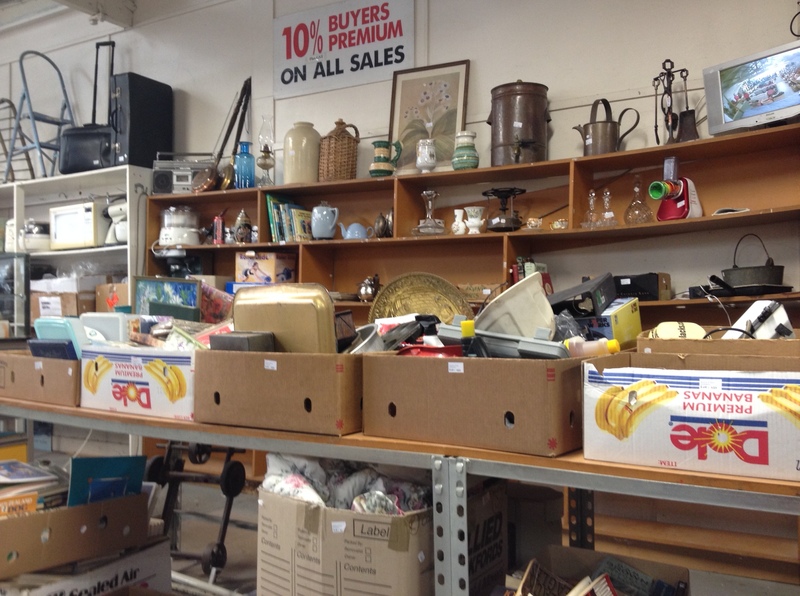 I turn left by the large garage-like door, go along the wall looking at the pictures, then I proceed through usually two avenues of furniture which is followed by the pictures on the opposite wall, which in turn leads me to the shelves on the wall, which are loaded with junk. Then I walk up and down the trestles loaded with cartons full of junk. This is followed by looking at the opposite wall until I end up clock wise back at the large garage door. This week I had some excitement. On the wall shelves I came across a teapot. Now I am a teapot aficionado – a collector, one of those crazy people who end up with a bedroom full of salt and pepper shakers. There were two teapots slightly below eye level, but the silver one caught my eye. I lifted it up and immediately knew ‘something was up’. It was too light to be either EPNS or Sheffield plate. I couldn’t immediately identify its period. It had two very strange characteristics. One was a pleasingly discoloured bone or ivory knob. The other was a very broad flange around the top of the teapot. I had never seen one like this before. I felt a prick of excitement – alertness. Covertly I looked around the auction rooms.I knew the men who worked at the auction paid close attention to what Douglas and I look at. It was not impossible that other punters would do likewise. But it was the usual tepid crowd of stray lookers, wandering around mildly. I turned it over quickly trying to find identifying marks. None. Except inside the lid there was a very very small rampant lion (sterling) and an alphabetical letter ‘a’. Almost surreptitiously I took out my phone and took a few photos. Now the chase was on. I forgot all my other tasks and priorities and started the familiar process of obsession. 1. I went home and got out the sterling identification books. ‘a’ seemed to belong to a strange period – 1896. I had a gut feeling this was not correct. The teapot had ‘some age’ to it and was even a little battered in parts. Douglas when he got home identified the ‘a’ as an earlier ‘a’ 1816 using a more detailed and comprehensive guide. Suddenly the teapot became illuminated by a kind of silvery shining light. I kept looking at my photos, enlarging them to see what my naked eye had missed. I texted my friend Shonagh Koea, who is also a doyenne of the unexpected. I said it had very small marks inside the lid but I could find none on the body. I also asked her to check past auction catalogues to get an idea of possible maximum price. Shonagh texted back: it was possible the identifying marks on the body of the teapot had worn away. If they were not on the bottom (the usual place) it was possible they were on the bowl of the teapot. 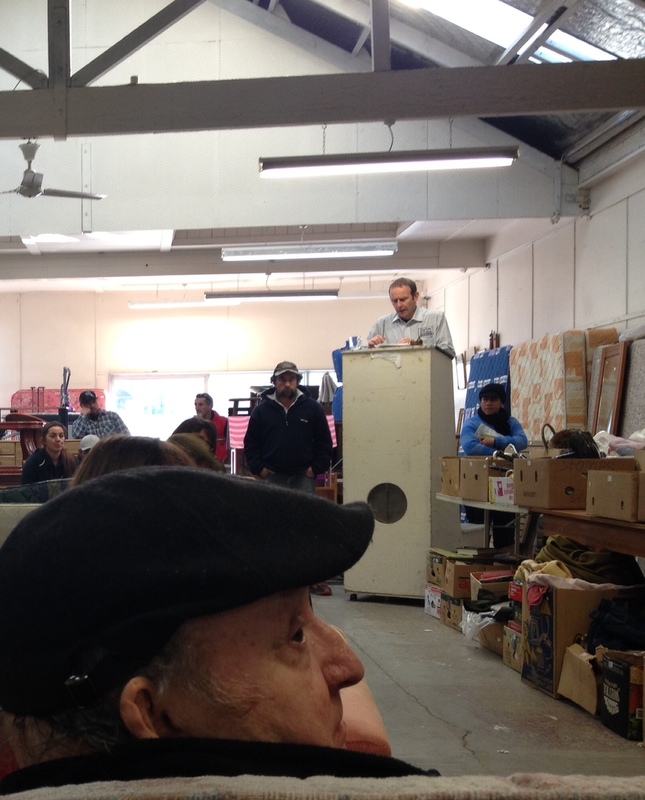 The following day I went back to the auction room. I pretended (oh I know it’s pathetic) to be inspecting other objects before I came to a rest before the object of desire. Now my eyesight intensified and became forensic. (I put my glasses on.) I could see faintly, faintly the identifying marks on the bowl. My heart leapt. My phone came out again and I took four photos. I did this because excitement makes my hands shake, and a blurred image is the result. I needed clarity. I casually placed the teapot back and returned home. 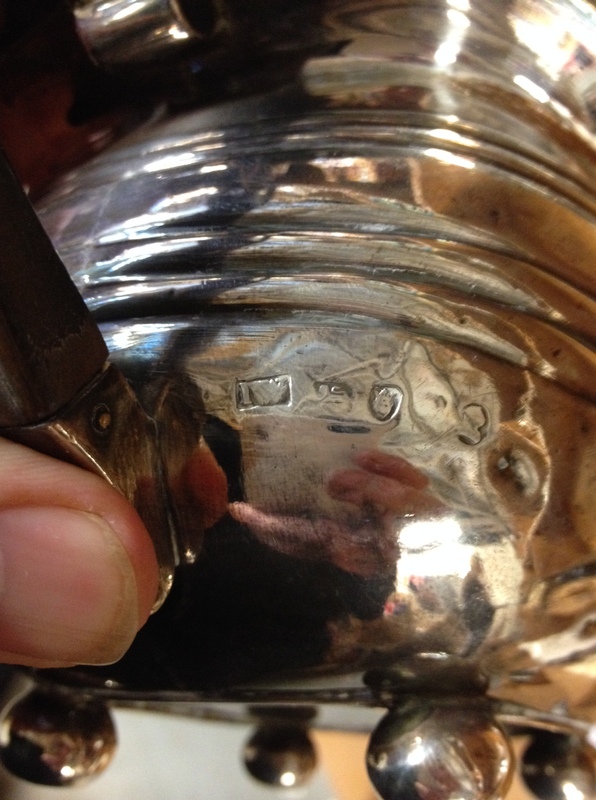 The marks revealed that the teapot was made in London (the leopard’s head) and the ‘J.W.’ was the identifying mark of three different London silversmiths – John Wakefield, John Welby and Joshua Wilson. None of them were stellar silversmiths but Joshua Wilson seemed the silversmith most active in 1816 when the teapot was made. This only made me want to get the teapot more. Let me make this clear. What made me want it was partly the object itself, but it was also the chase. The teapot was in an ordinary junk sale, when objects like old rakes or a box of dirty blankets struggle to get beyond $5. I had the fantasy I could get the teapot for less than $100. I might even, miracle of miracles, get it even cheaper. ‘Nobody’ wanted silver any more, because it entailed the shocking burden of polishing two or three times a year. That was the fantasy anyway. Shonagh texted back that $300-400 was a more realistic price I might have to pay. In my mind’s eye I had settled on $200. But a glance at the most recent Cordy’s catalogue showed me that a parallel Georgian sterling silver teapot had an estimate of $450. The great day of the auction arrived. The auction starts every Wednesday at 10am. It was lot 219. At 130 lots an hour that was approximately 11.30-11.45am, I reasoned. Nevertheless I found myself crossing the road to the auction house in a mild case of panic at 11.15. What if, for some unknown reason, the auctioneer had managed to roar through hundreds of lots and at that very moment people were bidding for the teapot. I got inside. Oh the relief. It was lot 169. I had taken a book with me to read and my cellphone so I could look at the photos I had taken, to reassure me. Eventually the number crept closer. I gazed around the room wondering who might be my competition. There were two soigné people in the far distance and I narrowed my eyes in enmity. (I was sitting in the middle of a row of chairs, which themselves were up for auction. This meant I could not see behind me, which turned out to be a tactical blunder). Eventually lot 219 arrived. Immediately I was taken aback as the teapot was identified as sterling. There was a book bid for $50. This was followed by one other bid. There was a pause. I realised I had to enter the race. The bids went up in ten dollar increments. Whoever was bidding against me was behind so I could not see. I held my hand up without retracting it, indicating I was not going to stop bidding. The bidding crept up to $200. A sudden silence fell in the room. Everybody was looking. The bidding went on and the auctioneer leapt to $20 increments. (Damn!) It reached $300 which was really my mental limit. The unseen person bid again – $320. Recklessly I decided to have one further bid. $340. A hesitation – a silence. The hammer went down. I had bought a Georgian teapot for $340 (plus the auction house costs of 10%, plus GST on that 15%.) These little additions can add up. But I felt light-headed with pleasure. I went outside to text Douglas and Shonagh. I was followed out by the owner of the local antique centre. He had been my competition. I took my prize home. Now was the time to inspect closely, to really find whatever faults your purchase has. This is the time for buyer’s remorse. The adrenalin fades away and you start to doubt your vision. But I was fortunate. The teapot responded beautifully to silver polish, suddenly revealing itself as a real thing of beauty. It was like the sun came out and glittered all over its surface. It was love. What do I think of the teapot now it is ‘mine’? It has a very jolly sort of look to it, a little bit nautical like a big-bellied 18th century ship scudding along on the breeze. I love its bone finial. It’s completely individual. The spout is so self confident and arching. It also pours beautifully. So I have decided that my few days of madness have been rewarded with something I have been wanting for years: a 200 year old Georgian sterling silver teapot. 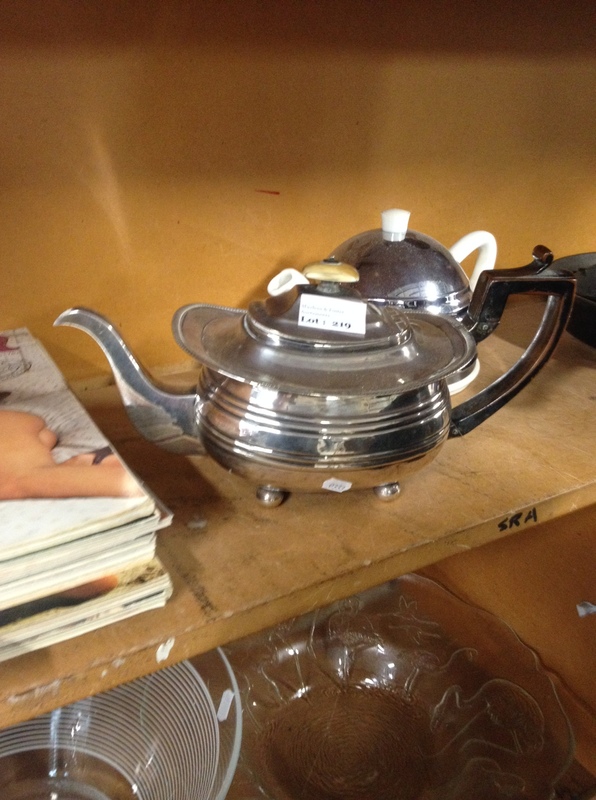 This entry was posted in auction finds etc., collecting, Uncategorized and tagged auction, auctions, cleaning silver, Georgian, Joshua Wilson, maidens and foster, silver, tea pot. Bookmark the permalink. Congratulations, hope I get to sample a brewed tea from you latest treasure! congratulations! nothing like the thrill of the chase followed by a win! Hi Peter – that was absolutely delightful to read! Took me back to all my times cruising the aisles of M&F, and the wonderful adrenalin rush when you are the one to take the treasure home. Passing the eft pos card over at Farmers has completely the opposite effect.